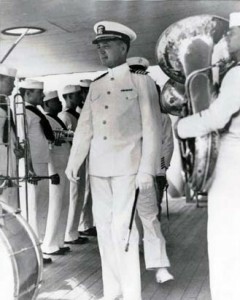 Approaching M.D. Anderson Library, you can’t miss Philip G. Hoffman Hall (PGH) nearby. 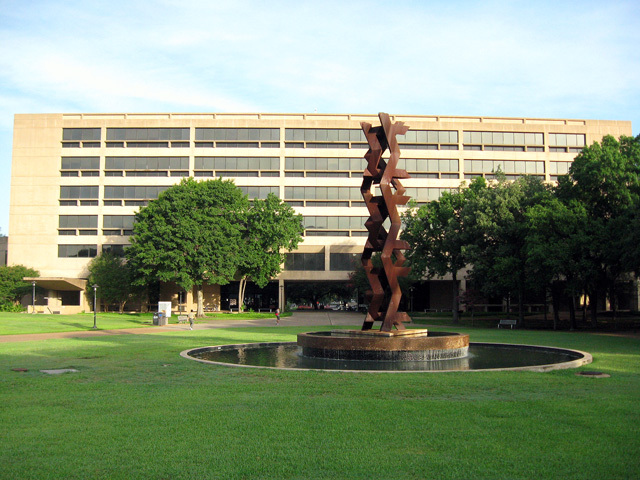 Completed in 1974, it honors one of the university’s most important leaders and is a major landmark at the center of the campus. 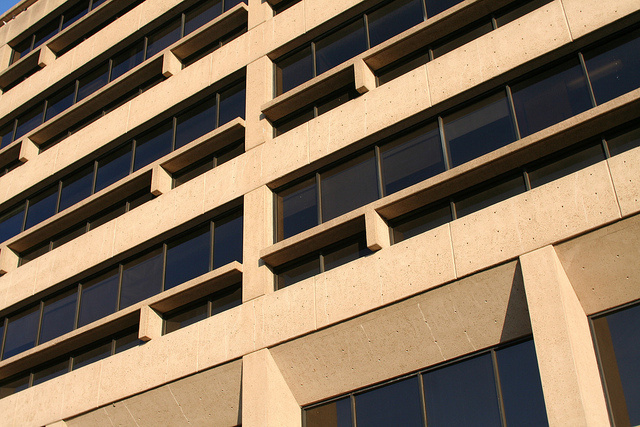 PGH and its neighbor, Agnes Arnold Hall, were designed by Kenneth Bentsen (UH 1952), a talented architect responsible for Houston’s Summit sports arena (1975) and other important buildings. PGH reflects the minimalist, modern style of the early 1970s. This style is not universally popular today, but formally this is a good building and I would like to show you why. Despite its large size, PGH is an elegant building. The strong horizontal lines visually lower its height. The façade is based on a grid, of course, but like a tartan plaid, the elements are interwoven, with some lines projecting and others suppressed. This is a subtractive composition where layers of the building are peeled away—slightly at the upper levels where, within each bay of windows, the projecting concrete fins provide a continuous bass note for the rhythm of repeating window mullions behind. There is a more pronounced cutting away at the lower levels; this culminates in the deep ground-floor gallery facing the plaza and the breezeway that penetrates the center. The slightly sculptural, three-dimensional facade prevents this from being just another boxy modern building. Bentsen’s attention to detail can go unnoticed unless you look closely. The concrete construction is left exposed—a common practice at the time—but concrete can be finished in many ways, from very smooth to very rough. It is not always done as well as it is here. Bentsen specified a slight texture and a warm color that is pleasing to the eye. The wall surface is scored by the repeating pattern of small holes left by the concrete pouring process. They form an almost imperceptible grid of dots that enlivens the surface of the building. The holes have to be there, but the designer decides how to arrange them. PGH is also impressive because of the way it is scaled to fit the plaza in front of it. The building occupies an important place at a campus crossroads, and visually it commands both the plaza and the broad avenue that it overlooks on the west. PGH should be understood at an urban scale, not a human scale: It is supposed to relate to the size of the plaza, not the size of the people in the plaza. PGH is worth another look the next time you pass by. Records of this and other Bentsen buildings are housed in the Kenneth E. Bentsen Architectural Papers in the library’s Special Collections Department, where they are currently being processed. A new exhibit has opened on the first floor of the M.D. Anderson Library. 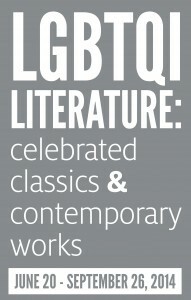 “LGBTQI Literature: Celebrated Classics and Contemporary Works,” curated by our own Julie Grob, features fiction, poetry, memoirs, and plays written by and about people who are lesbian, gay, bisexual, transgender, queer, or intersex. Opening now to coincide with the annual Pride Houston celebrations, the exhibit serves as an excellent educational complement to the festivities marking historical milestones in the movement. Tracing critical and popular literature from those days prior to Stonewall, the years following the so-called riots, through the dark days of the AIDS crisis, and on into contemporary pieces produced at the turn of the new century, “LGBTQI Literature” pulls from a number of distinct libraries available for study and research at the University of Houston Special Collections as well as a handful of pieces on loan from private collections. 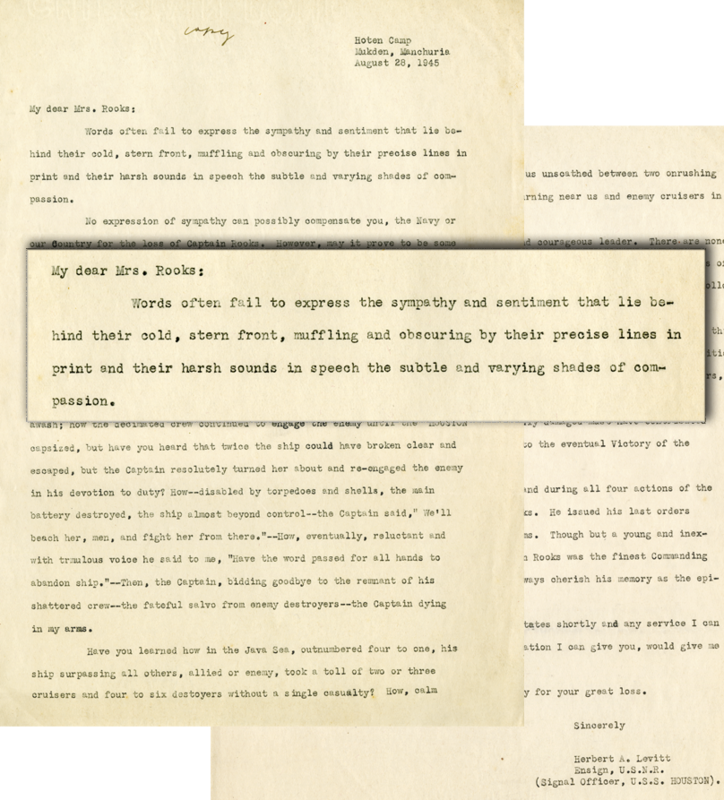 Prominently featured throughout the exhibit are texts from the Norma J. Lee Collection and the Edward Lukasek Gay Studies Collection, as well as works found in the Library of Cynthia Macdonald and the Kanellos Latino Literary Movement Book Collection. A cursory glance of highlights will show the likes of a 1928 first edition of Virginia Woolf’s Orlando: A Biography, Tony Kushner’s ever-popular Angels in America: A Gay Fantasia on National Themes, as well as an 1891 printing of Oscar Wilde’s, The Picture of Dorian Gray. We invite you to come view the exhibit for yourself, explore the exhibit’s website for more information, or stop by the History Tent on June 28th at the Houston Pride Festival and Parade where our own Vince Lee, Archivist for Carey C. Shuart Women’s Archive and Research Collection, will be in attendance with more information and artifacts on display. The Cadillac Ranch marks its 40th anniversary on June 21, 2014, only four days after the death of its patron, Stanley Marsh 3. 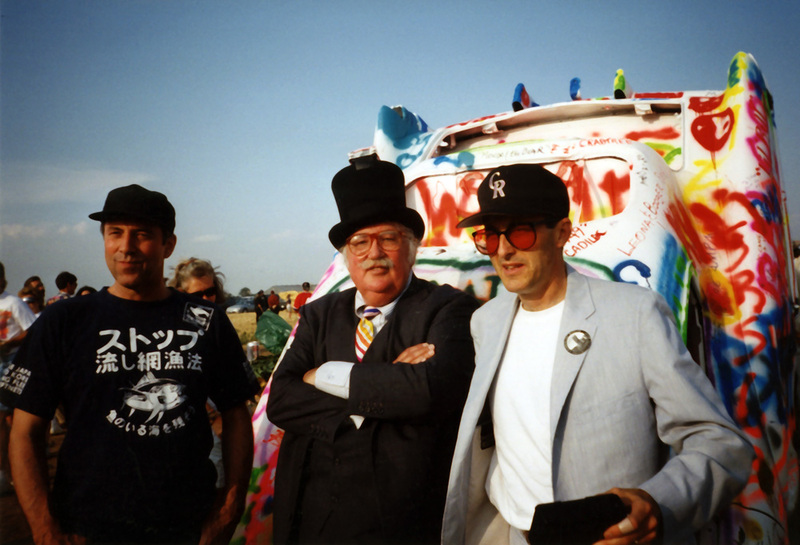 In this iconic art installation near Amarillo, the counter-culture art group, Ant Farm (1968 – 78), buried ten Cadillacs nose-first in a field alongside the old Route 66 as an homage to the Cadillac tailfin. 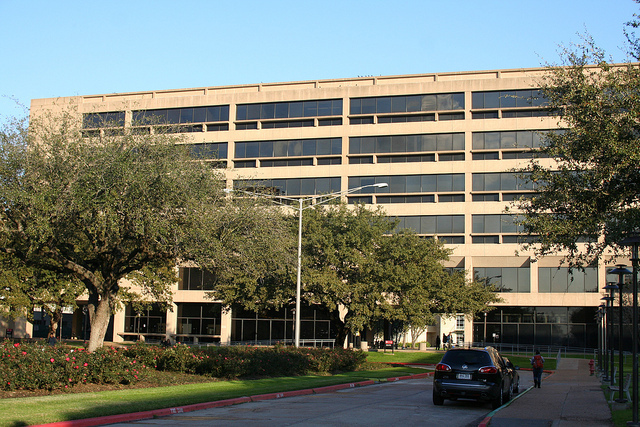 Ant Farm was based in San Francisco but got its start in Houston. 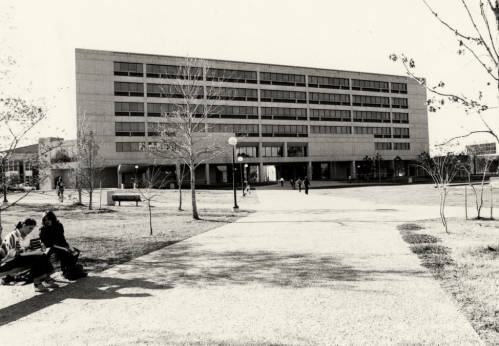 In 1969 the University of Houston’s College of Architecture hired two young architects, Doug Michels and Chip Lord, for a one-semester job as lecturers. They founded Ant Farm and moved to San Francisco when the semester ended. Among the readers was Stanley Marsh 3, an eccentric Amarillo businessman who often placed large outdoor art installations on his ranch. He invited Ant Farm—which by then included Curtis Schreier, Hudson Marquez, and others—to come to Amarillo and make some art for him. Their creation celebrated the love of the automobile and the open road that is at the heart of American popular culture. 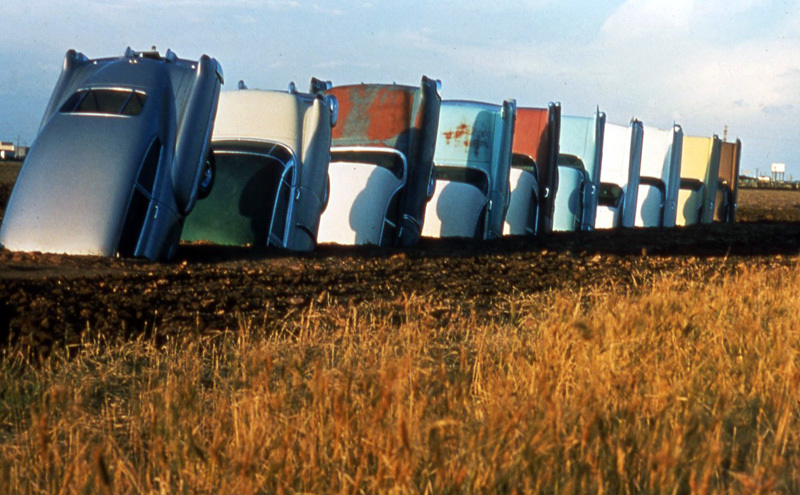 Cadillac Ranch made Ant Farm famous, inspiring a song by Bruce Springsteen (1980) and a Hollywood movie (1996). In 1978 Doug Michels returned to Houston where he created a futuristic media room called the “Teleport” for businessman Rudge Allen. Michels’ Star Trek-inspired media room was published extensively. The Allen family donated the room to UH in the late 1990s, and it was reinstalled in the architecture building. Michels reunited with his Ant Farm colleagues in 1986 to create the flying Thunderbird car sculpture outside the Hard Rock Café on Houston’s Kirby Drive (now demolished). Michels’ life came full circle in 1999 when the UH College of Architecture brought him back as a lecturer. He continued to practice architecture and design in Houston until his death in 2003. The university acquired Michels’ papers and drawings, and they now form the Doug Michels Architectural Papers in the library’s Special Collections Department. 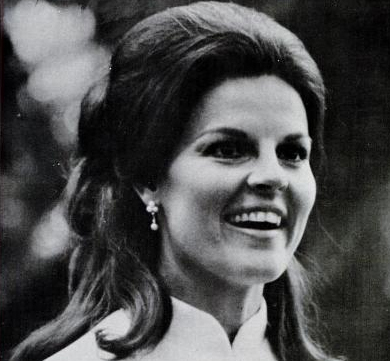 On the evening of June 16, 1977 thousands of Houston’s gay and lesbian community assembled to march on the streets of downtown in protest of Anita Bryant’s appearance at the Texas State Bar Association’s meeting. The successful repeal of the Miami legislation buoyed other similar, religiously fundamentalist groups around the nation. These newly organized activists would eventually exert more organized political influence through the end of the century under the Moral Majority umbrella, with Jerry Falwell using similar adversarial language and tactics as Bryant’s 1977 campaign. So it was that in 1977, at the height of her popularity and controversy, the Texas State Bar Association invited Bryant to appear at their meeting in Houston at the Hyatt Hotel. Their political influence lacking, Houston’s LGBT community was unable to block Bryant’s appearance in Houston but, donning black armbands emblazoned with pink triangles, the throng outside (which by some accounts grew to near 10,000), made their feelings known as they walked the streets and passed outside the Hyatt. Inside the meeting, Bryant sang patriotic songs and received a standing ovation. The galvanizing event had taken place, however, perhaps unbeknownst to those on the streets or the meeting hall. Almost a decade after Stonewall, Anita Bryant had unintentionally given birth to the organized gay rights movement in Houston. The Daily Kos argues as much in this piece and those interested in a better understanding of this complex history would do well to give it a read. Leaning heavily on Bruce Remington’s 1983 thesis, “Twelve Fighting Years: Homosexuals in Houston, 1969-1981,” it charts the rise of the gay rights movement in Houston, providing quotes and insights from those who helped forge history that night and the days to come. Here at the University of Houston Special Collections, we not only have Remington’s thesis available for study, but we also offer access to recorded interviews that were used as source material for the thesis. As Pride season approaches, we encourage you to take a closer look at Houston’s history which serves to remind us that June does not only remember Stonewall in NYC but, for better or worse, it also remembers Anita Bryant’s visit to Houston.